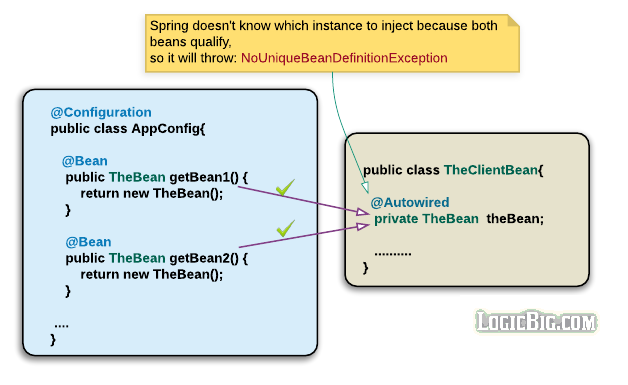 Spring Inversion of Control and Dependency Injection concepts. 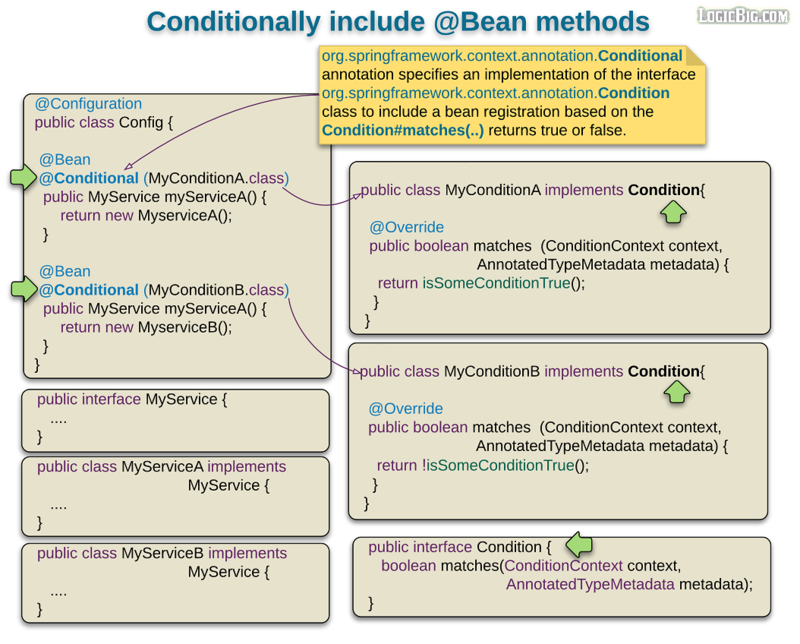 The bean configuration metadata and various Spring core concepts with examples. What is Spring Framework? Kick Start Example. What are different ways to configure spring application? What configuration metadata is used for? 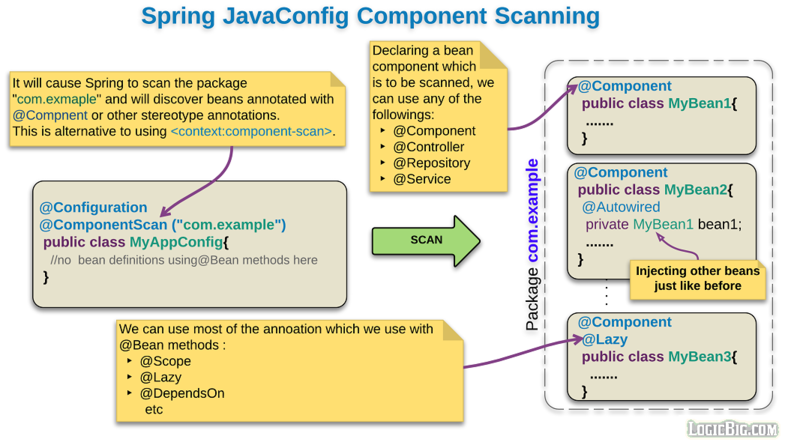 Configure and wire Spring beans using JavaConfig annotation @Configuration. Using multiple configuration classes. 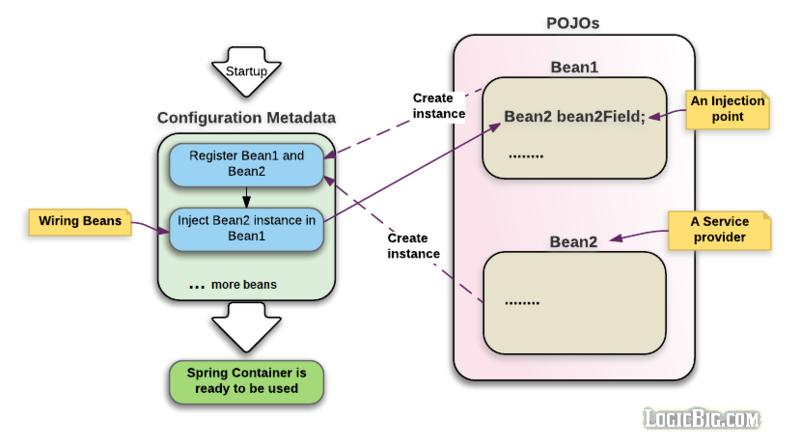 Bootstrapping Spring container with JavaConfig. 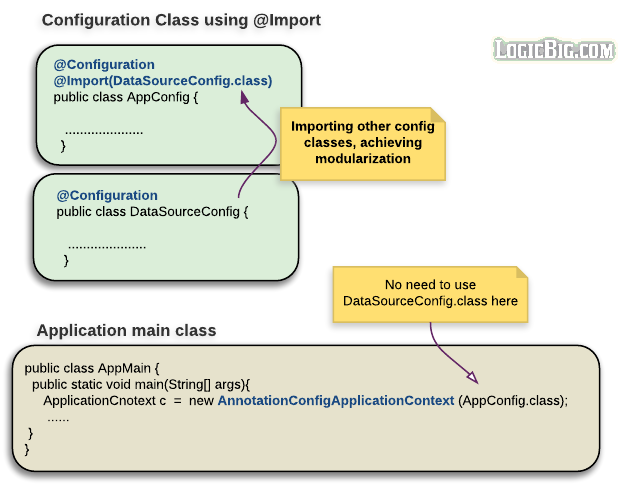 Achieving modularization by importing other configuration classes using @Import. Registering and customizing bean characteristic using @Bean. Spring auto wiring types with an example project. Inject beans by name to avoid conflict or if we just want to recognize a bean by name, with example project. Inject beans by name using JSR-250 annotation, @Resource. Types of dependency injection i.e. constructor-based, setter-based and field-based. Understanding when @PostConstruct and @PreDestroy are called. Other ways to get these callbacks. Lazy Initializing of Beans, using @Lazy annotation. When to use @Lazy. Example project. How @Lazy can be used at injection points? 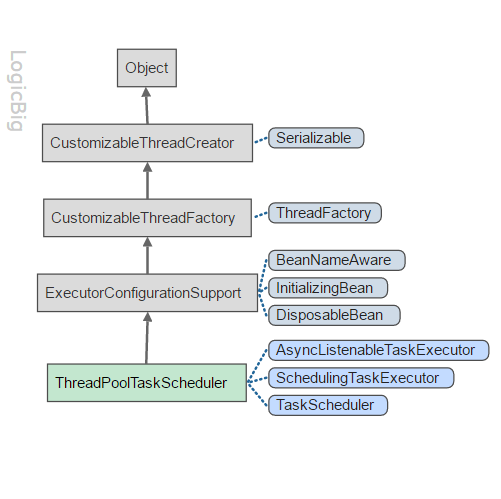 Configuring explicit bean loading order to avoid side effects in particular scenarios, with example project. What are different bean scopes. Using @Scope, Core scopes Singleton and Prototype in details with an example project. Spring JavaConfig using with Component Scan. @ComponentScan Example project. 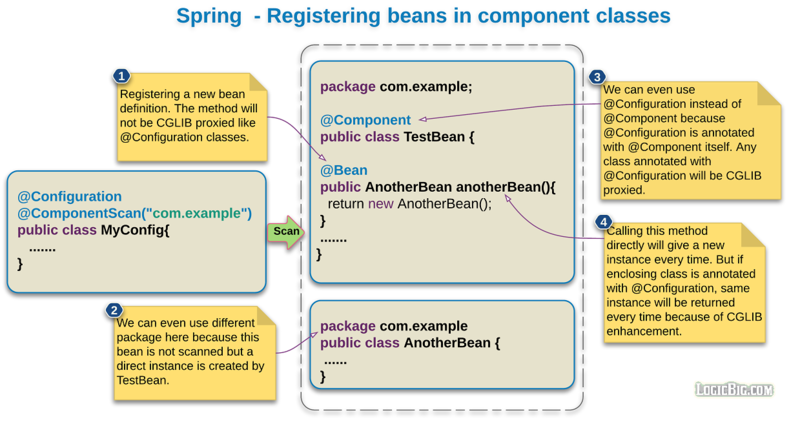 How classes annotated with @Component, can define new beans and register them with the Spring container. Using Filter element of @ComponentScan. What is implicit constructor injection? 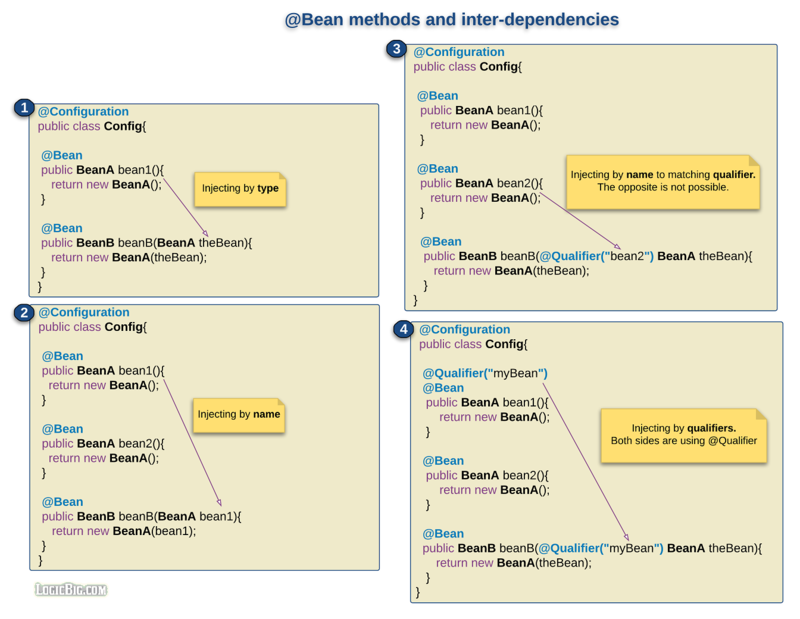 The @Bean methods and their inter-dependencies. Injecting collections using Java config, considering different scenarios. 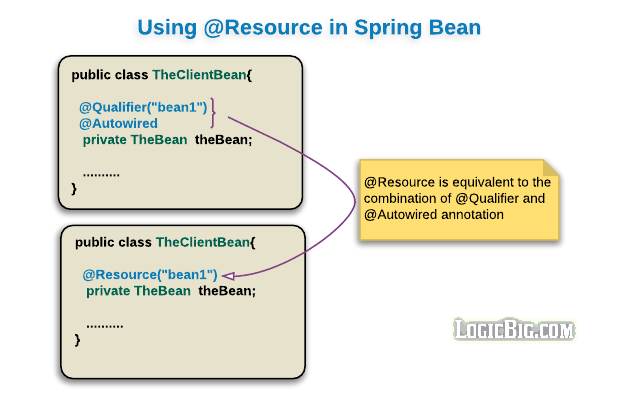 What are circular dependencies and how to inject them in Spring? Spring using @Primary annotation to resolve ambiguity at configuration level, with example project. Using generics as autowiring qualifiers, with example project. Different aspects and options of dependency checking during startup time. Include/exclude @Bean registration based on programmatic conditions. 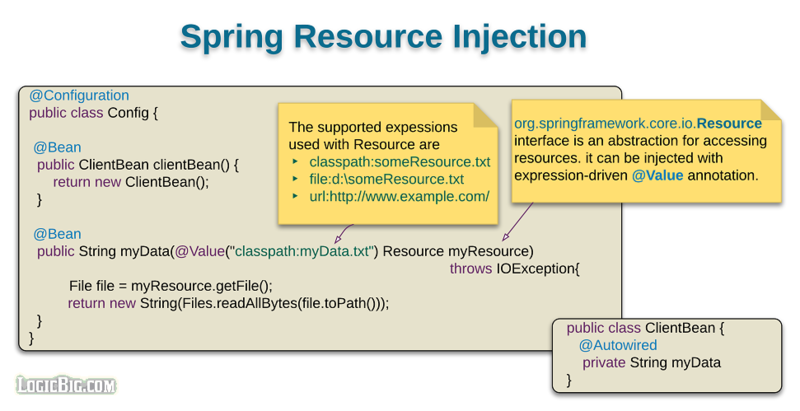 Example demonstrating how Spring (4.2) supports Java 8 default methods. The problem with injecting beans with narrower scope, for example Prototype bean into Singleton bean. Example project to demonstrate the problem. 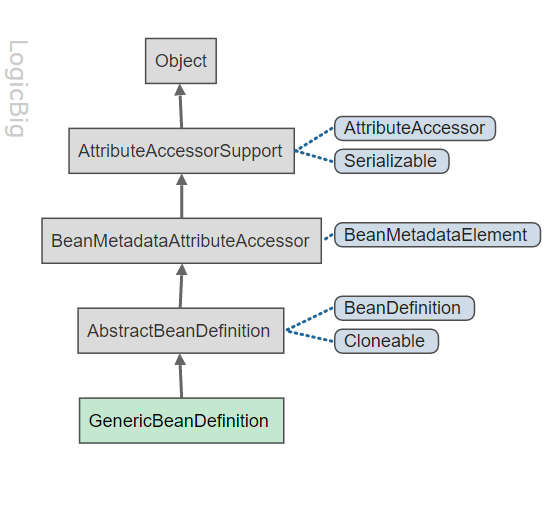 Injecting ApplicationContext into a bean. A workaround for injecting narrower scoped bean into a wider scoped bean, with example project. Using Spring @Lookup . A better solution for injecting narrower scoped bean into a wider scoped bean, with example project. This is another way to solve the problem of injecting a narrower scoped bean into wider scoped bean. Injecting JDK interface based proxy object using proxyMode=ScopedProxyMode.INTERFACES of @Scope annotation. Using JSR 330 Provider to inject narrower scoped bean . A better and Java standard solution for injecting narrower scoped bean into a wider scoped bean, with example project. Using Spring Profiles. Demonstrating the concept of profiles with an example project. 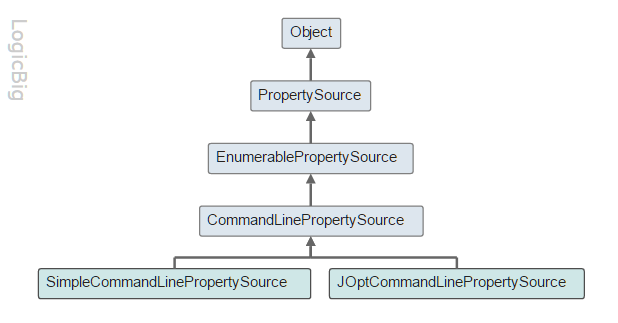 Obtaining properties from underlying system and from custom source using Environment and @PropertySource. 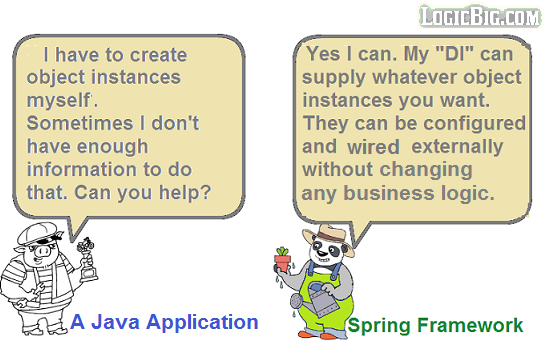 Spring support of using Java application args. 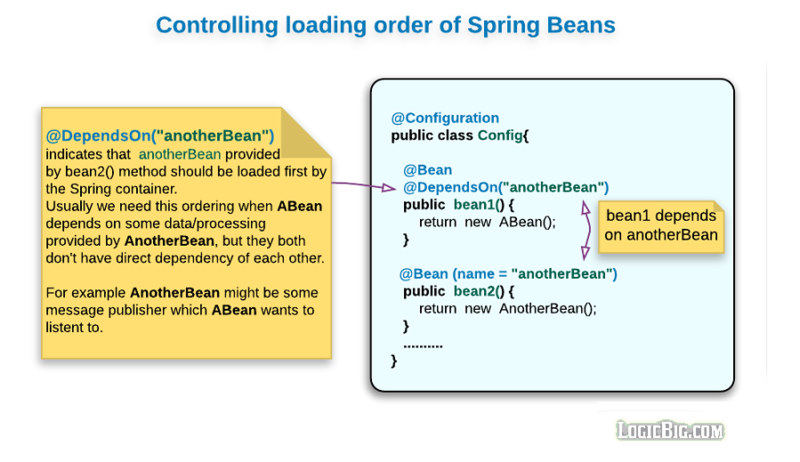 How Spring bean creation and manipulation is based on standard JavaBeans? 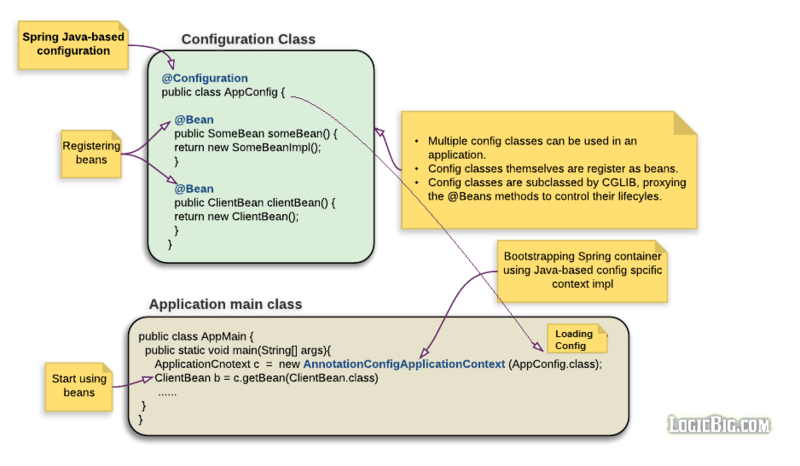 A quick walk-through of important classes/interfaces in package org.springframework.beans. 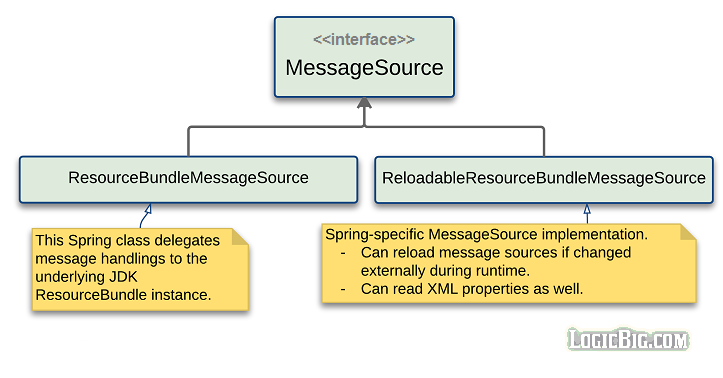 How core Spring uses JavaBeans API for text to object conversions. Creating custom editors. 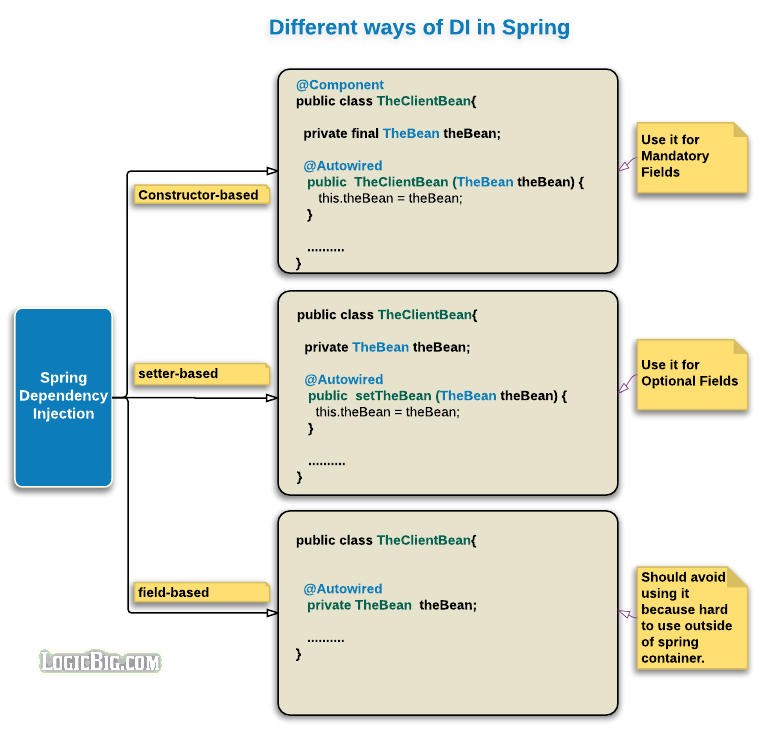 Using Spring default property editors in standalone applications. Core Data binding. What is DataBinder? The difference between using DataBinder and BeanWrapper. Different ways to validate beans in Spring at core level. Understanding how MessageCodesResolver is used. Creating constraint annotation in Spring Core. Performing method validation at Core level. Spring ConversionService for general type conversion. Different ways to create converters. 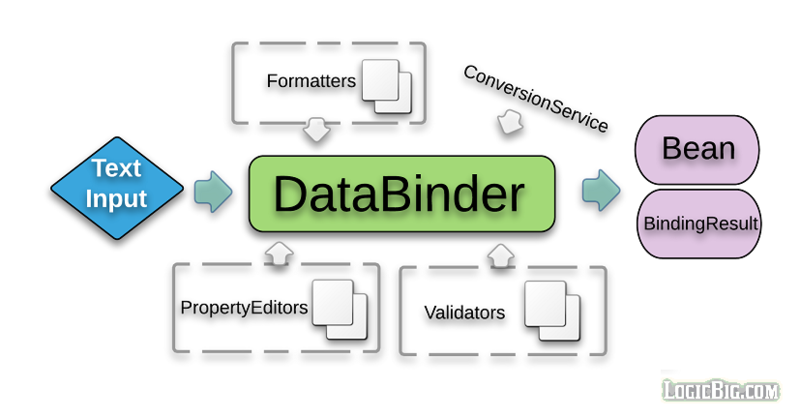 Using ConversionService with DataBinder. Spring Formatters on core level for rendering formatted string. What is annotation based formatting in Spring? Using Spring provided annotation for formatting. Creating custom annotation and binding it with a Formatter using AnnotationFormatterFactory. Spring Core thread execution abstraction. Getting familiar with interfaces: TaskExecutor, AsyncTaskExecutor and AsyncListenableTaskExecutor along with their implementations. Getting familiar with interface TaskScheduler and it's implementations. 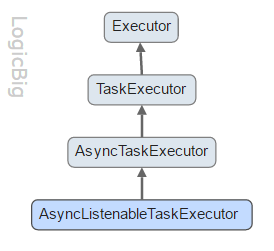 Using annotations @Async and @EnableAsync for annotation based task execution. Using annotations @Scheduled and @EnableScheduling for annotation based task scheduling. 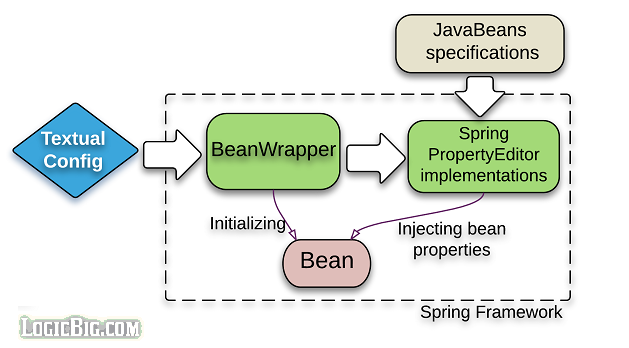 Working with BeanFactory and BeanDefinition to dynamically register objects as Spring bean. How configuration classes can be imported programmatically by using ImportSelector interface? The difference between DeferredImportSelector and ImportSelector. Using interface ImportBeanDefinitionRegistrar instance with @Import to dynamically register beans. How logging in spring works? What is default logging? How to use log4j as a JCL runtime implementation in Spring? How to use log4j2 as a JCL runtime implementation in Spring? How to use SLF4J in Spring? Using Spring TestContext Framework to do unit and integration testing. Using @ActiveProfiles to load a specific profile in a JUnit test. 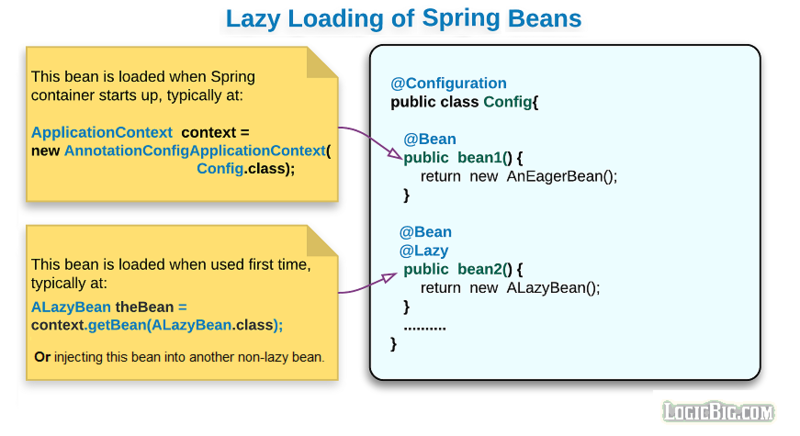 Spring Testing - Initializing ConfigurableApplicationContext with ApplicationContextInitializer. Using @ContextConfiguration initializers to initialize the context for tests. Using @TestPropertySource to load specific properties files in a JUnit test. Using @TestPropertySource with properties attribute to . How to use @TestPropertySource to load properties from default location? Using @IfProfileValue to ignore tests when a specific property value is not present. Using ProfileValueSource and @ProfileValueSourceConfiguration to specify a custom strategy to retrieve profile values. 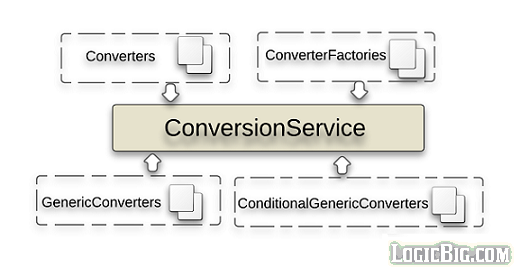 Understanding tests context configuration inheritance. What is TestExecutionListener? How can we use it?